This is a short, fun little story about life in 1650 in Southold, New York. It looks like Ms. McKinley put a lot of time into researching life in that area and in that time period, and it shows in this story. There are some fun facts about the time period woven into the storyline, and I think it’s a great way to teach children history. They are learning and they don’t know it! I didn’t know much about the wampum and so it was fun for me to learn as well. The story is written in a very simple style, but that makes it easy to read. The characters are fairly well developed, and the setting is well described. There are some really good descriptions in the story. I enjoyed reading this story and will most likely read it to my kids. I have it in e-reader format, so it’s not one I can just hand over to them to read. It will be a good time to talk about life during that time period and discuss our country’s history, which I definitely enjoy doing. This would be a really good story for elementary school children to read in class, or have read to them. You get a fun story and history included! Of course, it is historical fiction, but it’s based on as much fact as Ms. McKinley could find. I liked this story and recommend it, especially to teachers and younger readers. Recommendation: Third grade and up. This would be a great silent read or read-aloud book. destroys thousands of lives in the process. scientist and professor of roostory, who believe in the power of questioning. Chocrotes from his island of isolation and helps return him to the world without question. question, a person, or a Chicken can accomplish anything. This short story is actually a modern day fable! It’s been a long time since I read Aesop’s fables in elementary school, and this story brings a modern day lesson to the forefront. Yesterday my son was struggling with piano and didn’t want to ask his teacher any questions on how to do it better. Learning that it is okay to ask questions is a big step in each child’s life. A lot of kids don’t have this problem and ask a million questions a day, while others are afraid. There is a good lesson on why it is good, and important, to ask questions about lots of things. If we don’t question then we don’t think for ourselves. I enjoyed this story. It’s a quick 33 pages and is easy to read. It’s clean, except for an evil leader who kills those who ask questions. (There aren’t really any details about how those chickens die, you just know they do.) This is a great resource for teachers, especially of the older grades. It’s also a good resource for parents. Recommendation: 3rd Grade and up. I think this age group and up will better be able to understand the symbolism and the lesson. I liked this finale book. It wasn’t my favorite of the series, but I liked it. Having read all of them right in a row I was kind of getting sick of them, but I did like it. It was a little darker and a little more violent, but still okay. I liked how it showed the relationship between Gregor and Luxa blossoming and how it showed Gregor growing up and deciding that he had to sacrifice himself to save everyone else. I liked the addition of the code they needed to break. I really like Howard’s character, and Mareth’s character. I didn’t love the ending. I think Ms. Collins needed 50 more pages and a little more time. I thought it ended very abruptly and without closure for the characters involved (and me). I thought she killed off a character she shouldn’t have and it just made it so sad. Books don’t always need to have a happy ending (although it is nice), but this was just sad. I would still recommend the series because the rest of the series is really good. Recommendation: 3rd Grade and up. If you’re child has read the first four then I’d recommend finishing it for sure. You may want to read it to judge if your child is ready. I liked this book, however, it is darker than the first three. The things that happen are darker and more sinister, and evil. One main character dies, but hundreds of innocent minor characters die. And the main characters watch (they want to help but can’t). So, it’s harder to read, but it still has some happy moments, and Boots is as cute as ever. Gregor finds his abilities are lacking in certain areas but is learning to control them better. It is a fast, easy read, but sad and depressing. If you have read the first three you definitely need to read it, just know that it’s not too happy. And it leaves you hanging at the end. I like the characters and I like that as the books go on we continue to learn more about each character and each circumstance. I like that the characters grow before our eyes, and I’m quite attached to some of them. Ms. Collins’ writing style is easy to read and definitely draws you in. I have the next one sitting on my dresser so I don’t think I’ll be doing much today. Recommendation: 3rd or 4th grade and up. If your child is a third grader you may want to preview this one first. It is more depressing and may be harder for a third grader. My 4th grader read it and commented to me that he didn’t like it as much because it was more violent. 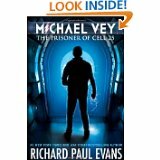 This book has all the suspense and action that the previous two books had, and the story takes an interesting turn. Of course there is the prophecy that they don’t really understand until it all happens, and some lingering questions, even then. It is a fast, easy read and definitely a page turner. A new Overlander ends up going to the Underland, and that throws some twists and turns into the story. Gregor grows a lot in this book, I think. Which is good. I think he is starting to learn more about himself and find confidence in his abilities. At the same time, he is still a child, only 12 years old, and there are times when he acts like a 12 year-old boy. Which is annoying, but realistic. There are also some new characters introduced, and I ended up liking them a lot. I find this series interesting, when compared to Suzanne Collins’ other famous series “The Hunger Games.” That series, of course, is not written for the same age group, but the messages of war and peace are quite different. In “Hunger Games” war is fought as a game. It is meant to entertain and teach a lesson to the spectators. They are to learn not to fight against their leaders. In “Gregor,” war is fought for protection. It is also fought to gain something like a cure to a plague or to fight an evil creature. In this particular book, there is a message that war should be the last resort. Gregor has never liked his role as a warrior, and he has never liked fighting, but he has done it to protect himself and his Underland friends. He has also done it to gain something. In this book he begins to think about how war might not be the only option sometimes, but sometimes it is necessary. I don’t like political statements in children’s books, and this could be portrayed as one, but it is not overly bearing and works in the book. But, I know my 10 year-old didn’t quite catch all of that, so it may be a mute point anyway. Recommendation: 3rd or 4th grade and up. My 10 year-old, 4th grade, loved it. I had heard a lot about this book and so I was excited to read it, and my son wanted to read it, so I needed to pre-approve it for him. I have to say, it did not disappoint! I really liked this book. It’s engaging and definitely a page-turner. The concept is so different, which I like. Mr. Evans’ writing style draws you in and keeps on moving. I loved the characters. Mr. Evans’ character development is so good that you feel as if Michael is your best friend. Taylor and Ostin are right up there as well. I liked that some of the unfavorable characters at the beginning change to allies in the end. Characters I wanted to hit at the beginning became some of my favorites at the end. I also liked the relationships between the characters. I liked how Mr. Evans had them relate to each other and play off each other. Even though it’s unrealistic, when you are reading it, it becomes reality. I felt like I could actually someday meet someone with a power like this. Crazy, I know. Cell 25 didn’t play as much of a role as I thought it would, but it did show the strengths of certain characters. It also showed the evil and indifference in other characters. I loved that this book was clean! There is some violence, but no profantiy and no “physical intimacy.” The violence included high school boys’ pranks and after school fighting. It also included fighting between good and evil at the end. Some guards die. The evil character asks good kids to do bad things. Some of them follow and some of them don’t. I loved that it showed kids that you can resist peer pressure and not do things you are uncomfortable with, or that you know are wrong. My 10 year-old son is very excited because it is 10 yr-old approved! Recommendation: 3rd grade and up. I think even my third grader will be okay reading it. He’s reading “Harry Potter” right now, and there is more violence and scary stuff in that than there is in this book. He may not understand the technological stuff (like what an MRI does), but I don’t know if my 10 year-old does either. I’ll have to explain that. If a third grader hasn’t read anything like “Harry Potter” or “Percy Jackson” then it may be too much. I was really excited to read this book because I really enjoyed the first one. It did not disappoint. It was full of action and took Gregor on quite the adventure. It wasn’t a happy journey, at all, and there was a lot of loss. Loss of animals and people. There were some surprises and there was some predictability, but overall I really liked it. You could tell Ms. Collins was setting the reader up for book #3, but that’s ok. As an adult, I just read. I don’t really look for what I think is coming, and the younger readers, like my 10 year-old son, don’t either. If you do, you may predict the ending, but I just sit back and enjoy the story. 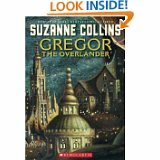 I always like to see how the prophecies turn out, and the creative ways that Gregor finds to fulfill them, and the creative ways he uses the “Overlander” resources to help himself and his friends. I really like the characters in this series, and I began to like the new characters that are introduced in this book. I like Ms. Collins’ character development, especially with Gregor and Boots and Luxa and Mareth. I do want to know more about Mrs. Cormaci, so I hope that comes into another book. She seems like she might know what is going on, but you can’t tell for sure. Rating: PG+ (Not quite a PG-13, but might be too much for some younger readers.) Violence, death of animals, fighting. Recommendation: 3rd grade and up. If your child is in third or fourth grade and is sensitive then it may be too much. My fourth grader loved it. I liked it as well. (Summary taken from the back book cover) “When eleven-year-old Gregor follows his little sister through a grate in the laundry room of their New York apartment building, he hurtles into the dark Underland beneath the city. There, humans live uneasily beside giant spiders, baths, cockroaches, and rats–but the fragile peace is about to fall apart. Gregor wants no part of a conflict between these creepy creatures. He just wants to find his way home. But when he discovers that a strange prophecy foretells a role for him in the Underland’s uncertain future, he realizes it might be the only way to solve the biggest mystery of his life. little does he know his quest will change him–and the Underland–forever. I am so glad I found this book! This is a good, fun book. I was worried about it for my 4th grader since Suzanne Collins’ Hunger Games is NOT 4th grader approved, but it turned out to be really good. It has a fun and different storyline, which catches you right from the beginning. It’s a fast, easy read, and it has some fun twists and turns. The writing style is easy to read and draws you in. It is clean from start to finish (except for some war violence), which I love. I really liked the characters, especially Gregor and Boots, and thought their character development was good. I loved the relationship between Gregor and Boots. It was so cute how much he loved her and how he takes care of her and protects her. Not too many young boys would feel that way about their little sisters. Some of the Underland characters were developed well also. I thought it interesting that she used everyday, not so nice, creatures to become some of the best and nicest characters. I also like that this is a series so I know that my 4th grader has at least that many books to read before I have to find him something else to read. I really enjoyed this book and definitely recommend it! Hopefully I’ll be posting the review for the second book soon. I love that you can have a great book that is clean. So great. Rating: PG Clean–no swearing or “physical intimacy”. There is some war violence with characters dying. And some of the “big bugs” may scare younger readers. Recommendation: 3rd or 4th grade and up. I enjoyed it. It’s not Harry Potter, but it’s enjoyable and a fun read. Since I just reviewed “Turbocharged” I was interested to see the difference in the two books. And, wow, what a difference! They are completely different! “Turbocharged” asks you to give up grains, dairy, and sweets for the rest of your life. I knew I couldn’t do that. 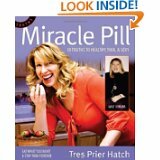 “Miracle Pill” teaches moderation and compensation. Ms. Hatch has a fun style of writing. It is very easy to read and understand, and it is filled with personal anecdotes. I really like the concept of this book. Ms. Hatch teaches a lifestyle and thought change. If you want to eat Thanksgiving dinner, she says, then go ahead. Then the next day cut out sweets and carbs and eat mostly fruit and veggies. If you want a bagel for breakfast, go ahead, but then maybe don’t have a roll at dinner. She teaches you to look at the food you eat and recognize what you still need to eat (more whole grains, more fruit, more veggies) or what you have had enough of (I don’t need to eat another grain because I had toast at breakfast, etc.). I like it because it is more me. I can do this. I can add more fruits and veggies (which I did say I could also do after I read “Turbocharged”) to the meals I make, and I can help my family be more healthy. Her focus is being healthy for the rest of your life. Ms. Hatch also has a great idea with exercise. Moderation. She says all you need is moderate exercise 5 days a week, for 30-50 minutes. She walks and then will add a short jog in the middle of her walk. She asks you to make sure that your exercise program is something you will be able to do until you are 80!! I really like that this book is easy to follow and do. She gives a lot of examples and even has some good recipes at the back of the book. She makes this more into a workbook giving places to fill in answers and write goals and steps down. It’s not just about losing weight, it’s about being healthy. And, she even suggests you have one treat a day!!! That’s the best part! I think this is more my style and will definitely be implementing this in my life and with my family. Rating: G It’s family friendly and clean! Recommendation: Late middle school and up, unless the entire family is reading it and implementing it together. I don’t like stressing younger kids out about their weight, unless they are truly obese and need to take efforts now. This book isn’t just about weight though, it is about being healthy. It is great for the entire family to do together! I loved this book! As you may remember, I didn’t love this series at first. I think it was Book 3 that for sure hooked me, and the finale was all it needed to be. I am really sad to let the story go and to say good-bye to the characters. There is plenty of action and romance and trickery for everyone. I had no idea how Mr. Mull would finish it, and it worked. The last line wasn’t my favorite, for some reason, but it fit. I really liked this series and my son is on Book #4 so it’s fun to talk with him about the stories. It is clean and well-written. Mr. Mull has really grown in his writing since the first book, and it’s fun to take that journey with authors. He is creative and imaginative, and it is a good, fun read. If you are reading the series, you have to finish it off by reading the finale, you won’t be disappointed. Rating: PG-13 Violence (killing the demons, fighting, death of some characters) No profanity or “physical intimacy” scenes. Recommendation: 3rd grade and up! This is good, clean fun for the whole family. Yes, there is some death and violence, but it isn’t over the top or too gory. If you think your child can handle a few characters dying (they are not the main characters) and some demon-killing then they will be fine reading it.